Aditya Puri has been at the helm of the high-performing $90 bln HDFC Bank over two decades. He’s now nearing retirement age. Stunning returns favour a mooted rule change allowing him, and others, to stay on, but blowups elsewhere suggest timely succession may be better. SenseTime has exited a venture in Xinjiang, where efforts to crush Muslim extremism have involved mass detentions. The deal may attenuate bad PR before an offshore IPO, but the $6 bln startup still sells facial recognition tech to China's police. Foreign backers get only thin cover. Foreigners can finally control mainland asset managers, but few are likely to sell given the $3.7 trln market’s promise. CICC could be an exception. Its fund arm is tiny, but it has licences that Larry Fink’s firm prizes. If BlackRock buys the outfit, similar deals should follow. 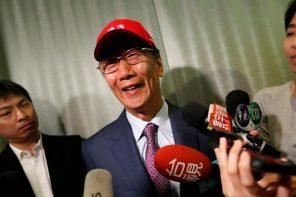 Terry Gou, chairman of the $39 bln iPhone assembler, says he plans to step down from day-to-day operations soon. The details are vague, and there is no obvious succession plan either. A well-managed handover, though, could bring new blood, and a long-delayed governance revamp. Most of the 100 biggest U.S. companies let executives use company aircraft for personal trips. These perks tend to be a small part of executive pay but are red meat for social and financial activists. Some small firms are flagrant too. Yet there are some role models out there. Cho Yang-ho has died at 70 just weeks after shareholders ousted him from the carrier’s board. The family-controlled holding company’s market value promptly soared by a fifth. Momentum for Korean corporate reform may be slowing, but this reaction suggests investors yearn for more. Google has scrapped an advisory council on artificial intelligence after protests about a few members. Yet it deserves credit for training staff on the dangers of unintended bias in algorithms. More outside input, particularly from academia, can help Silicon Valley reduce risk. Leaders like JPMorgan CEO Jamie Dimon are enthusiastic recent adopters of the form mastered by Berkshire Hathaway’s Warren Buffett. But penning sweeping views of what ails the world and the dangers of short-termism takes time. Breakingviews offers a template for corporate chiefs. The electric-car maker’s CEO presided over big production and delivery drops last quarter, especially on its high-margin vehicles. Bigger losses for longer look likely. And the SEC now has more ammo over Musk’s tweets. His refusal to pump in more capital looks ever more dicey. After nearly three decades of growth Down Under, there are fresh signs of sputtering. Fourth-quarter GDP grew just 0.2 pct, house prices are falling and wages only inching up. There are reasons for optimism, though. Canberra’s spending power, for one, can keep momentum going. After multiple Chinese trading-experiment flops, a new board for fast-growing tech and biotech startups looks more auspicious. Its rules strike a balance between liberalisation and discipline. The approach could improve mainland markets at the expense of New York and Hong Kong. The solar company wants shareholders to swap frozen shares for stock in a vehicle which may or may not relist in China. Hanergy might well be ejected from the Hong Kong exchange before trading resumes, denying them an alternative. This raw deal would set a terrible precedent. Women hold too few roles in corporate America, especially in engineering and computer science. Verizon’s Genia Wilbourn joins Breakingviews to discuss how she and the telecom company are addressing that, from diversity training to influencing suppliers to the CEO’s crucial role. A spate of tough decisions on banks and other oligopolies augurs an era of stricter regulation. The broad inquiry into financial misdeeds helped spur an overdue crackdown. It's also a new risk for boards and investors as a long, stable growth streak Down Under looks vulnerable. New Delhi's plan to compel the likes of Facebook and Google to police their content threatens free speech. Coming after edicts that limit foreign e-commerce giants, there is a touch of the People's Republic that will worry global players relying on the subcontinent for growth. A second disaster in three years has already cost the mining giant $19 bln in market value. Fines and a management overhaul will likely follow. Fresh scrutiny from stakeholders will hit an industry already grappling with high costs, slow projects and risk-averse shareholders.